Eco Springs Perth provides Water Coolers for office, warehouse, factory, home or anywhere else you may require clean, fresh, filtered drinking water at a fraction of the cost of bottled water. 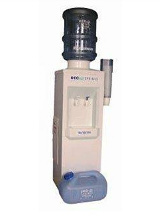 1) Commercial grade, stand alone gravity fed system with refillable bottle. Cool & Cold or Hot & Cold. Great for areas that are not near a mains water supply, just plug into a powerpoint and you have safe, great tasting drinking water. 2) Commercial grade, stand alone mains plumbed in system - direct from your main water line, Cool & Cold or Hot & Cold. No bottle to refill, just a continuous supply of pure filtered water on tap 24/7. 3) Commercial grade, bench top mains plumbed in system - direct from your main water line, Cool & Cold or Hot & Cold , ideal for limited space - small kitchens and limited floor space areas are no problem with this space saving unit. 4) We can supply and fit filtered under sink units with sink side spout if required. 5) If you own an existing watercooler or spout, Eco Springs Perth can complete regular, full services with new filters for you at any time.